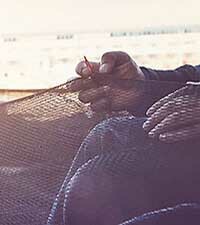 We carry all of the products you need to make and care for your own fishing nets. At Memphis Net & Twine, we offer all the net making supplies you need to make or repair your fish nets – including all the floats, leads, twines, ropes, needles and fillers, and other supplies you might be looking for. We offer several types of monofilament nylon line that is ideal for repairing different styles of monofilament netting or cast nets. From 10 lb. to 150 lb. monofilament nylon line, you'll find it at Memphis Net & Twine. For fishermen who make their own crab and fish traps, we offer plastic and vinyl coated mesh wire in many different mesh sizes, which simplifies the trap making process. These nettings can also be used for or use as poultry or game bird netting. To make the job of netmaking and fish net repairing easier, we also offer net needles as well as manual or electric needle fillers. And of course we have plenty of fishing floats, both foam and plastic. For net making supplies that are ideal for all sorts of uses, from fishing to agricultural applications, shop Memphis Net & Twine!